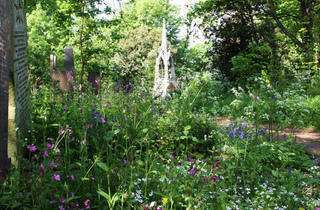 Set in a disused nineteenth century cemetery, this 33-acre park is home to a cornucopia of wild plants and animals. During spring and summer, a sea of wildflowers including native bluebells pop up between the mossy gravestones. You can also spot numerous species of birds and butterflies. Probably the least glamorous of the Magnificent 7 London Cemeteries, that said it has charm and is steeped in history. I didn't feel I was able to get aimlessly lost walking round as it's fairly small and I was constantly aware that I was in Bow as you pass by the tube line and roads. There are however some interesting graves and I imagine in summer it would be really pretty with the flowers and trees in full bloom. Such an great place - lots of interesting graves to read plus all the nature. They run lots of events here for both adults and children and the annual shuffle festival is always brilliant. To be able to lose yourself in the woods, in the middle of Tower Hamlets, is a pleasure not to be underestimated. Plus there are a myriad of ways you can get involved here, from history walks to volunteering at forest school. Good for the soul! A peaceful oasis in the middle of Bow. Watch out for the bats, spiders and killer moths!!! It's an amazing ecosystem in the middle of Town! You just have to visit it and take in all the nature and history. A magical escape in the middle of Tower Hamlets. So much fun for children of all ages (and parents and grandparents). There's nowhere like this place, the volunteers work their backsides off and my dog loves it more than life itself. Nature in the middle of the East End. A lovely space. It is a peaceful oasis in a much needed, densely packed area. A unique oasis in the middle of urban life. Highly encourage you take a nature walk with one of the knowledgeable staff. An amazing place with the fantastic Ken and his wife in charge - inspiring to young and old alike. A very special place that is both a green haven for wildlife and for people. It's socialable, and the staff are amazingly helpful and friendly and they have a fantastic programme of events and activities. It's got a unique feel and atmosphere. Beautiful, atmospheric, peaceful place for exploring, walking, learning! 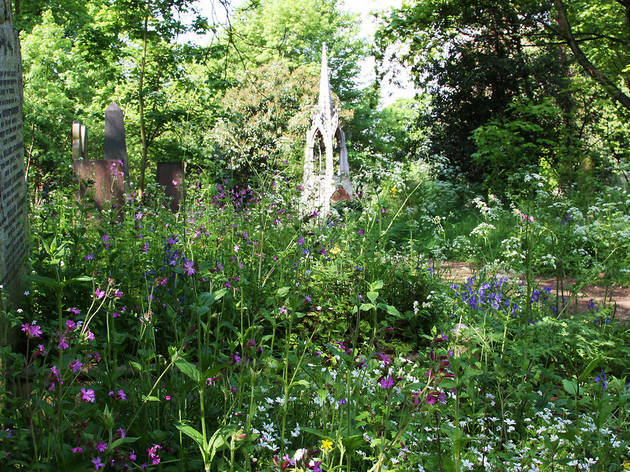 Tower Hamlets Cemetery Park is London's most urban woodland and a closed Cemetery filled with the stories of lives lived, industrialists, entrepreneurs and inventors. It's also home to some many special and unexpected species of wild plants and animals. It contributes massively to people's mental and physical well-being and plays a fundamental role in combating Nature deprivation. An oasis of green in a very densely populated area of London. You have to visit! Glorious urban woodland - love to walk through the Cemetery Park and just enjoy the beautiful deciduous woodland - in all seasons it's beautiful and provides a welcome rest from the roaring traffic along Bow Road. The Friends of the MECP run guided walks on wild foraging and there are lots of other seasonal activities. A fantastic site for kids and adults alike! Myself, my husband and our two grandchildren spend a huge amount of time in THCP and we all love it, it's a very special place. I want the children to grow up understanding about nature and conservation and THCP is like a micro version of the countryside, with wild flowers, bees, soaring trees and many birds and animals. You can really feel the changing seasons and there is always something new to see and hear. Considering it's in the middle of Tower Hamlets it can be wonderfully quiet, a rare find in central London. I'm so happy that we live so close to such a wonderful place; it is one of my most favourite places ever. Go see it- a forest in zone 2. Take your children to the fantastic Forest School run here. I love this park. Something to see at every visit. The team provide educational walks about birds, foraging and the changing seasons. Precious and beautiful wild space in the heart of an area that gets more and more built up by the day. Well maintained and cared for. Even though I am disabled I can walk on the paths with my walking aid. All kinds of stuff to interest you. This is a fascinating, cultural oasis; a different side of the borough that you won't regret visiting. THCP is a haven of peace and beauty literally stuffed with flowers, bird song, butterflies and more. Every time I visit I breathe deeply amongst all the green and marvel at this tranquil natural space just a short distance from noisy Mile End Road. Went on an excellent Coppicing Course here - it's a beautiful place too, with overgrown gravestones, lots of wildlife and some really intersting history to discover. Very handy from Mile End tube, too. This is a magical and peaceful place in the middle of a very busy part of London. It is good for the soul just to be there. This little park is a hidden gem. This is a beautifully wild yet carefully managed green space right between the frantic bustle of the city and residential areas of Tower Hamlets. It's an oasis of wildlife where often rare species can be spotted, too. Beautiful park in the heart of the East End. If you're a dog owner this is dog walking heaven. Unexpectedly lovely park in the middle of a very inner city area. I hadn't heard of a cemetery park before, but it seems to combine the tranquil, reflective qualities of a cemetery with nice though slightly overgrown gardens for strolling around. I am sadly yet to find the Byzantine style chapel and Chalk Maze the sign speaks of (has anyone found these? Do they exist?) but still, if you feel like you've been rushing around a lot lately, this place is good for spending a few hours quietly wandering and thinking about what's important in life, namely, life itself, and spending time outdoors in parks. History and nature all in one tranquil place. Totally fascinating and wonderful woodland full of wildlife right in the heart of Tower Hamlets. It's the home of the excellent Shuffle film festival, but if you've only been for that, you're missing out. Lots of events all year round! Lovely place to walk around, to sit and think, to breathe in fresh oxygen, listen to the birds singing and to watch the butterflies flit about. And, it's minutes from a central London tube station. Marvellous! It's my daily walk to and from work and it's a pleasure. After 12 years I still get a thrill seeing the foxes and other wildlife. Sunny, misty mornings make this place magical. London's most urban woodland and one of London's magnificent seven cemeteries. Providing a piece of the Countryside in the City and connecting people to local history. It's home to many rare and unique plants and animals and provides educational workshops to over 7000 local children. Fighting nature deprivation and connecting children to nature on their doorstep. This is the most awesome place in East London. It has wildlife, trees and other plants and is of interest every day of the year. An oasis of peace and countryside in the heart of East London. The manager, his staff and the volunteers make this a vibrant, exciting place to visit with its regular walks, events, educational opportunities for children and adults. In summer it is host to the Shuffle Festival which introduces films and happenings to inspire and entertain. A place to visit and enjoy every day of the year. An inspiring oasis showing God's glory in his children's faith and the wonder of his lesser creations.